A protest for fair housing in Portland from a collection of historical prints from the Oregon Historical Society. Event attendees will be able to learn about the connections between the Civil Rights Movement of the 1960s and1970s and the social justice movements that are currently occurring. The panelists will discuss how things have changed, how they have stayed the same, and what audience members can do to get involved. Haynes serves as the senior pastor of Allen Temple CME Church in northeast Portland. He was a youth organizer for the Southern Christian Leadership Conference in Southeast Texas, a field organizer for the Student Non-violent Coordinating Committee, and a co-organizer of the Black Panther Party. Richardson is president of the Eugene and Springfield NAACP. His family lived by and practiced the idea of holding African cultural with value and dignity, and currently works to facilitate conversations on identity and cultural inclusion. Abioto is an adventurer, dancer, photographer, and writer. She created The Black Portlanders series, an ongoing photo essay and exploratory blog imaging people of African descent in the city. 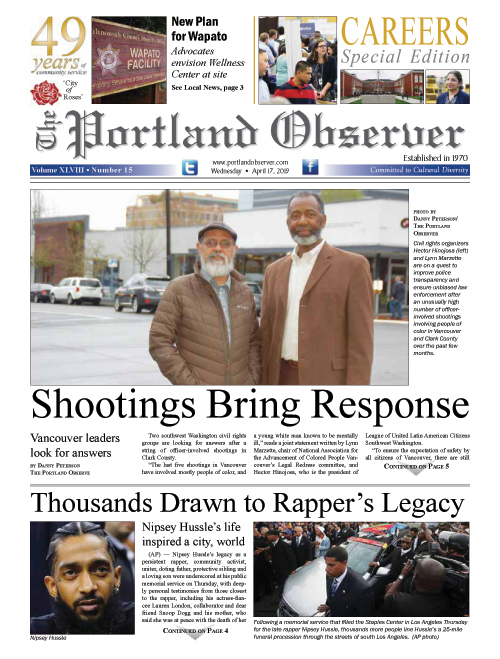 Hampton was preparing to begin studies at Portland State University when a confrontation with police brought him to the attention of Kent Ford and the city's new Black Panther Party chapter. He worked with the Panthers to establish the Fred Hampton Memorial People's Free Clinic and free breakfasts for children. Hardesty grew up in Baltimore and joined the U.S. Navy after graduating high school. After moving to Portland she began working with the Black United Fund. She represented northeast Portland in the Oregon House of Representatives from 1995 to 2000. In 2014, she took over the leadership of the NAACP Portland chapter.